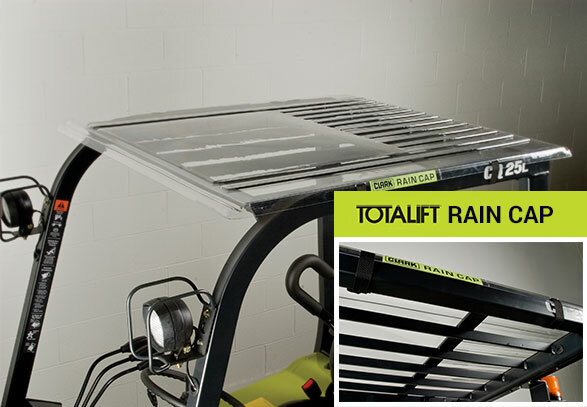 CLARK TOTALIFT Rain Cap is a rugged & well designed roof cover for current & late model lift trucks. Always verify measurements as well as model applications. "Overhead Guards Shall Not Obstruct the Operator's View." CLARK TOTALIFT Rain Caps feature a unique dome design that diverts rain and small particulates away from the operator. Channels and gutters eliminate cascading water. Rain Caps are made from clear ultra tuff SG weather-able polycarbonate, or gray-tinted ultra tuff SG weather-able polycarbonate material. Tinted caps offer added UV protection. With the designed domed top and side channels this aids to prevent dripping on the operator. This alternative to shrink-wrap, plywood, and cardboard provides greater operator comfort and safety. The ease of installation eliminates shop time, and expense.